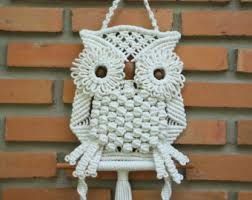 Whooooo Does Macramé Anymore? Whoooo? With all the serious matters of state and planetary survival to worry about these days, it’s time to turn to handicrafts. When I was a kid in 1970s America, we enjoyed a folk-craft craze. I learned how to do “country painting,” in which we sanded and stained barn boards and then painted plump peaches on them with oil paints. With precise little scissors we cut out Holly Hobby figures printed on wrapping paper—little bonneted girls in prairie dresses—and decoupaged them to plaster plaques, finishing with velvet ribbon loops for hanging. And we bought jute cording and knotted it into macramé projects: bracelets and headbands (groovy!) and plant hangers and owls. For some reason, we were very big on owls. I was pretty good at all this stuff back in the day. But I buried my inner crafter for decades, perhaps imagining that those days were somehow “simpler times.” Were they, though? 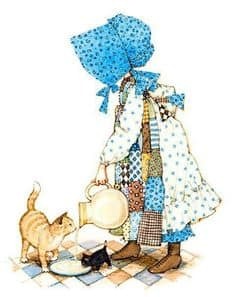 Now I wonder: did the adult women of my childhood take up their craft projects, and teach them to their daughters, as a way to manage anxiety about the oil crisis, double-digit inflation, the Cold War, and Watergate? Well, it’s worth an experiment to find out if that strategy would work, don’t you think? On our sister blog, the post calvin, the writers have been engaging this month in “micro-stunt journalism,” in which they endeavor to “try something new, take on a challenge, or perform some other interesting feat strictly for the purpose of writing about it.” The results have been wonderfully entertaining stories of cooking with Ina Garten for a week, canoeing Michigan’s most dangerous river, and trying not to cry during a performance of Hamilton, among other things. Inspired, I decided that I, too, would undertake an interesting feat. 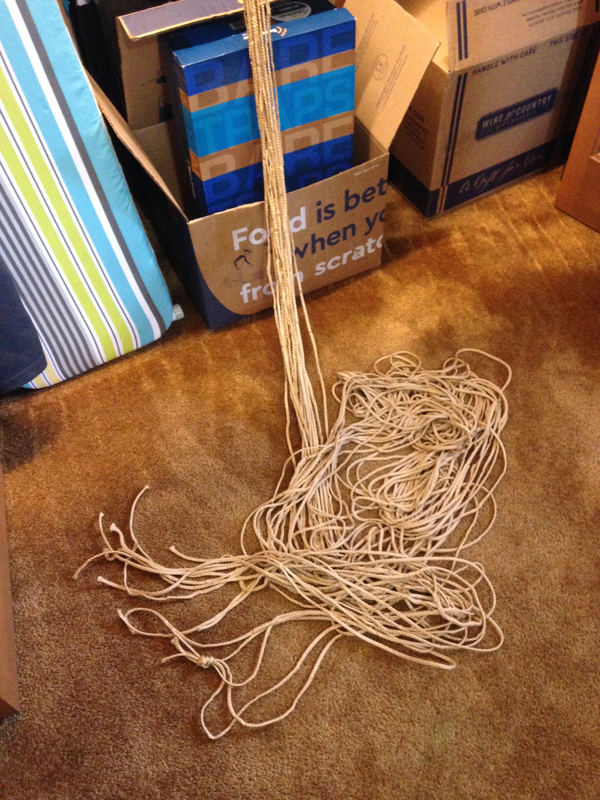 Project: make a macramé plant hanger. Burning questions: Could I do it? And does crafting relieve anxiety? Because I finally gave away the gigantic rubber tree. It was a beautiful and friendly plant, but at five feet tall and six feet wide, it could no longer deny its covert plot to conquer my entire three-season porch. Rather than hack it down to size (again), I posted an adoption ad on Craigslist. One day later, a very nice person named Dave came with his truck and trailer. He kept calling the plant “she,” and we agreed on an open adoption (I can visit any time). So off “she” went. But now my porch looked too empty. Here’s where this becomes a lesson in “one thing leads to another.” I raised my eyes to the ceiling over the empty corner and noted: a ceiling hook. 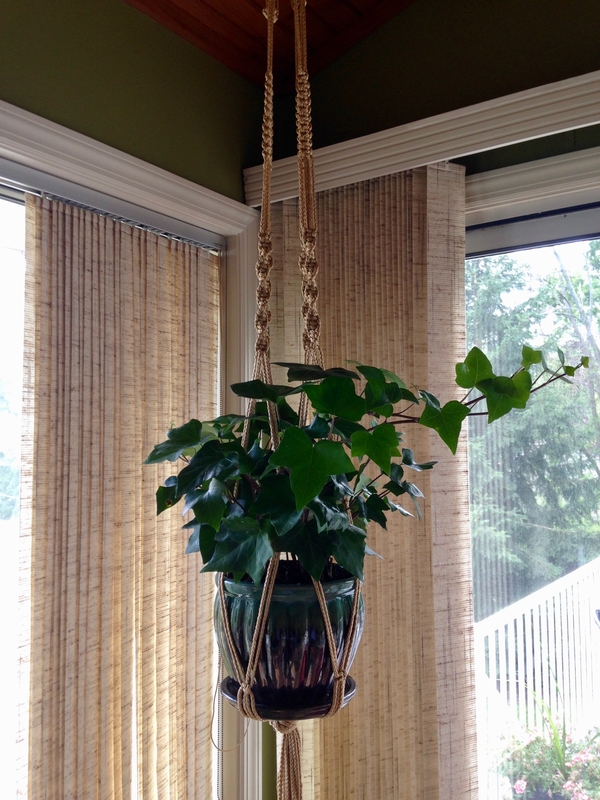 Obviously, I need a hanging plant, and obviously that calls for a macramé plant hanger. This is the way of my people. Research result number one is that, at first, crafting actually raises anxiety. Because now I have to 1) get a new plant, 2) figure out how to do macramé, and 3) actually do it correctly. In a moment of self-doubt and consumer addiction, I searched Amazon for macramé plant hangers. Why make one when I can just buy one? Bingo. I order an attractive, basic hanger for $8.99. Two days later, it arrives. Alas: far too short. If I were to hang a plant in this thing, we would have a lovely view of the pot bottom. (Note to macramé hanger orderers: sometimes the given measurements are from the top ring to the bottom of the pot holder part, and sometimes from top to bottom of the long, dangling tassel. Beware.) Amazon wants six bucks to take the thing back, so never mind. Buying a much larger plant hanger would cost fifty bucks. All right, now it’s a challenge. I will make my own for less. Game on. Then it dawns on me: the library! An online catalog search confirms they have books on macramé. I head downtown and find myself standing in front of shelves of craft books, scanning the whole Dewey Decimal neighborhood. There’s a book called Crocheting for Dummies and another called The Joy of Sox, which title seems sufficient reason to take up knitting. At last I find three macramé books squeezed between the knotting and knitting sections. Anything useful? Nope. I realize I must consult YouTube. And improvise from there. I find the perfect plant at Flowerland, an English ivy. I bring it home and transplant it into a pretty pot. Ivies are supposed to trail, but this one is positively perking. I fall a little in love with this plant. It deserves the perfect home. Now to YouTube to find videos featuring capable women doing crafts. I am always so impressed with capable, crafty women. They may not possess evident glamour, but don’t be fooled. They can do anything. I settle on a video in which Jenny, a young Brit who pronounces it “muh-CRAH-may,” demonstrates making a plant hanger that could work for my purposes, though I will have to double the length. I will also avoid the hideously pink cord she is using. I begin with her measurements and double them to figure out how much cord I will need. Carry the one, convert to yards: voila. I need 96 yards. Capable women, after all, can do math. I purchase the correct amount of attractive, neutral cord (not jute—too itchy) for a total of $5.98. I also need a ring to hang the thing from, and unfortunately I have to purchase a package of eight for an additional $2.99. Annoying, but that still leaves me at a total of $8.97 plus tax. A win. Anxiety level: holding steady, eased by successful math and bargain shopping. Go time. I set up my laptop for ready consultation and hang the ring on a hanger hooked on a closet bar. 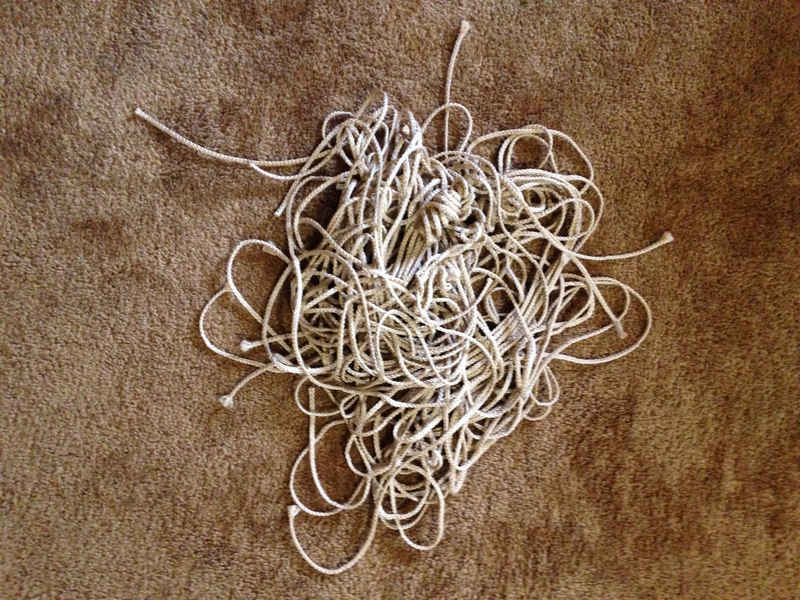 To start, I have to cut eight strands of cord, twelve yards each. Once I get the strands cut and doubled over the ring, I am now basically in Rapunzel management mode. Then I start knotting. You know what? It’s fun! Half knots and square knots come back to me after four decades of dormancy. After a few minutes, I’m improvising with total serenity, doubling the segment lengths and gaining confidence. Then I hit the tricky part, the “Josephine knots.” I watch the instructions over and over and try it numerous times. I don’t know who Josephine was, but I don’t think she was mentally stable. Jenny’s Josephine knots look like Viking brooches. Mine look like popcorn kernels. I decide: who cares? They look kind of cool anyway. It takes a couple hours, maybe three. I should be timing myself, but I’m in the zone, you know? I am careful to make the various knot series fall at the same length on each of the four braids, and I measure my overall length periodically to make sure the thing will turn out just right. And it does. Tie up the final knot. Measure. Perfect. The final step is to take a lighter and hold it to the end of each cord to seal it off, an oddly satisfying process. Two seconds in a flame and the fibers fuse. Macramé cord technology has improved since the 70s, I’m here to tell ya. 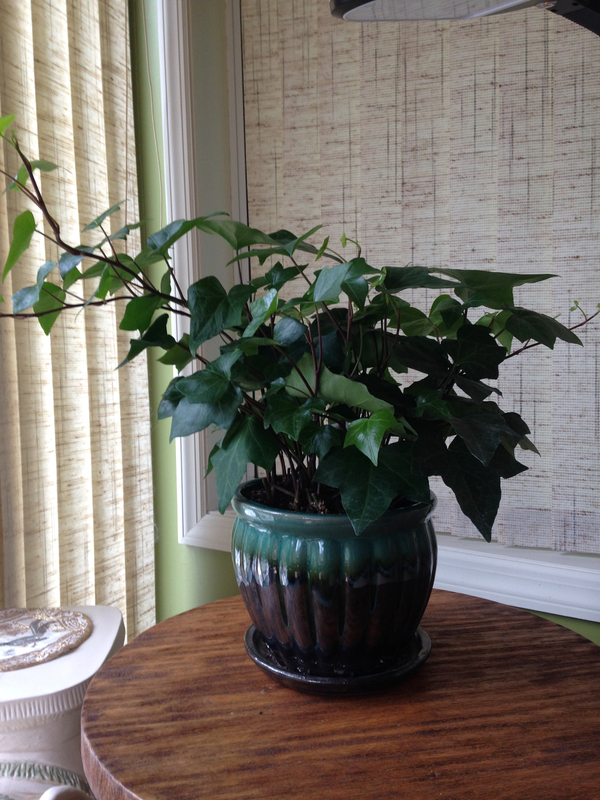 So my English ivy seems to be enjoying its new home, and I am pleased with the finished effect. However, now I look at that corner of my porch and realize it still needs one more thing: a tiered plant stand for my other plants. As I say, one thing leads to another. Yes, folk crafts do indeed reduce anxiety. In fact, I bet if you have read all the way through this, you haven’t thought about the demise of civilization even once for a good three minutes. See? It works. Would I do macramé again? Sure. But if I make a project for you, it will cost you fifty bucks.